More children at younger ages are being exposed to technology and more are being given these devices to have as their own. More children and teens have multiple social media accounts. Cyberbullying is on the rise. Teens are concerned about their personal information not being private on the internet. Parents don’t seem to be aware of the responsibility they are placing on their children to have access to so much damaging exposure that they carry in their pockets. Here are some statistics on how many parents are actually actively monitoring their children’s activity online. While 90 percent of teens say their parents trust them to be responsible online, 45 percent said they would change something about their online behavior if their parents were watching. Among parents with children less than 8 years old, they use the following methods to help control their child’s media content access 57 percent of parents watch or play the content first. Almost 70 percent of pre-teens admit to hiding online activities. 91 percent of parents say they are well informed about what their teens do online or on their cellphones. Three in five teens say their parents know what they do online. 93 percent of parents say they talk to their teens about online safety, while only 61 percent of teens report having this conversation. 38 percent of parents with younger teens, aged 13-15, said they monitor or follow their children’s cell phone use very closely. 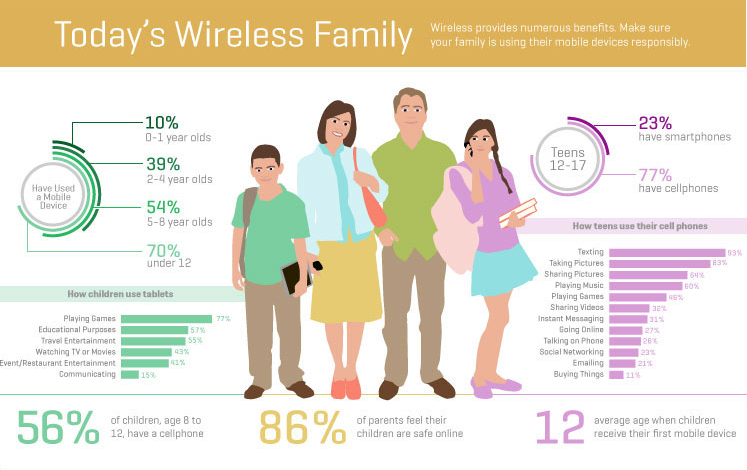 53 percent of parents use some sort of parental control feature to manage/monitor their child’s Internet use. 86 percent of parents feel their children are safe online. 89 percent of parents find online safety education for their kids to be critical. 84 percent of parents who use social media follow or are connected with their children, hoping to gain access to their interactions with followers and the information they post. 32 percent of parents set rules for how their kids use their smartphone. Not all parents are doing as well at monitoring and teaching their children about technology as they think they have been. Click on this link to the be aware section of a website called Growing Wireless. This site has helpful information for parents who are seeking to become better protectors of their children’s online and technology usage.